Zachary James Watkins and Marshall Trammell unlearned their instruments and investigated their history. Black Spirituals slips in and out of idiom-resistant categories. Zachary James Watkins speaks with his hands. Recently, he readied a thought by miming the careful handling of a small orb. Then, the guitarist motioned as if drawing a length of thread out of his skull, and explained, "I want people to hear me struggling to find that note, then my playing with it, losing it, and looking for another. "I navigate between beautiful tones and ugly tones, but they all need resonant, rich timbres," Watkins continued. "I have no patience for weak timbres." Watkins, 34, and percussionist Marshall Trammell, 43, compose Black Spirituals, a local duo that slips in and out of idiom-resistant categories such as free jazz and improvisation. They met in 2012 through a workshop that Watkins organized at UC Santa Cruz, where he worked as a lecturer until recently. As an educator, Watkins took electronic music to underserved communities, while Trammell helmed performance series, including Decolonizing Imagination, which showcased improvisers from diverse backgrounds. They admired one another's diligent focus on cultivating distinct, expressive musical vernacular and commitment to foregrounding heritage and history. The first time Trammell and Watkins collaborated was live at the UCSC workshop with theorist and improvisor Morgan Craft. Earlier this year, the duo appeared together on stage in Amsterdam. 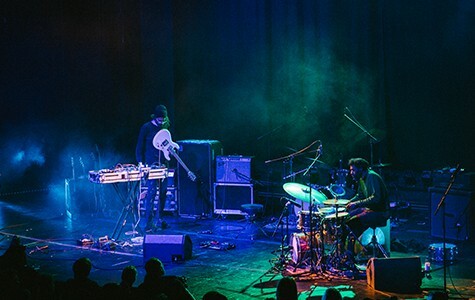 It was the first night of a 32-date European tour supporting Earth, the revered drone-metal progenitor — a major coup for an ensemble steeped in the local experimental community. Of Deconstruction, Black Spirituals' debut full-length released late last year through Sige Records, features three probing instrumentals with punctilious blips, swelling fields of alternately gorgeous and jarring electronic scree, and percussion with the sensibility of a restless soloist committed to evading convention. The tones, meanwhile, feel elemental and embodied, which helps explain why Watkins spoke frequently of "sensitivity" in regards to listening effectively, the optimal trait of an instrument, and investigating history. "[Trammell] doesn't give you a pulse," Watkins said. "There's no beat to chew on." Live, Trammell demonstrates jazz fluidity in his erratic, skittish patterns, though he rarely commits to anything resembling a groove. It's constant derailment, a procession of ideas without the typical signals of change in between. Watkins, who is 6-feet-6-inches, doesn't hold his guitar so much as cradle it, using cool, deliberate motions to manipulate feedback. His rig is designed to respond to the slightest gestures, which reflects the nuance he appreciates in Trammell's playing. "[Trammell] brings the human, the feel, the sensitivity of the ear to the sound relationship — he doesn't even like to call them drums." Watkins grew up in Lubbock, Texas. His father, James C. Watkins, is an esteemed ceramic artist and professor, and Watkins Jr. took lessons as a kid from an eccentric piano teacher. She indulged his preference for intuition over sheet music early on. "She'd show me something and I'd bring my own version back the next day," he recalled. "I was basically improvising on a theme." Still, an empathetic piano teacher couldn't keep him in Texas. "When you're seventeen and you visit an art school website, realize you can study electronic music in the city where Nirvana is from — that's amazing," he recalled, explaining his decision to hone composition at Cornish University in Seattle. Still, he found the experience somewhat lacking. "I'm not really interested in art school," he said. "I want classes that don't tell you what's good or bad, but that help you develop sensitivity." Watkins preferred the approach at Mills, where he did graduate work. Pauline Oliveros' Deep Listening class, he recalled, emphasized little more than, well, listening, and then journaling those aural observations. Moreover, Oakland's broader experimental community instilled Watkins with misgivings about his focus on just composing for other players. "I struggled with composing for improvisers because their vocabulary is so unique," said Watkins, who now lives in Oakland. "I got more interested in the breadth of colors that they called upon," and resolved to create his own palette. Inspired by Japanese noise artists, Watkins generates feedback through a no-input mixing system, while his guitar is treated to enough pre-amplification that it emits lustrous sounds without even being strummed. 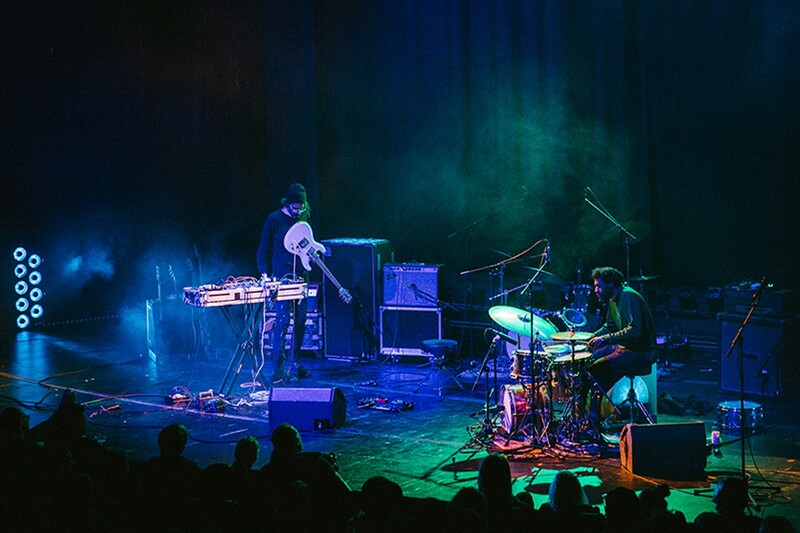 As the two sound sources interact, Watkins minds how his guitar's physical distance from the speakers fur ther affect the sound, a process that entails learning a new room every time he performs. "I'm balancing these really noisy, loud timbres and these very rich, resonant timbres," he explained. "The performance is about me finding the intervals and transforming them differently every night." Similarly, Trammell, who currently resides in Atwater, fundamentally reconceived his instrument. He mapped his drum set three-dimensionally and analyzed the spatial coordinates between pieces, acquiring a new perspective that enabled him to "de-genre-ize" the instrument, ridding it of associations with extant styles. "Coltrane, Ornette, Cherry, Cage, The Art Ensemble — they all reinvented music in some way," he said, referencing progressive jazzmen and composers. "We have to learn our instruments and then invent a new role for them. ... I got away from being a drummer and I was allowed to be a percussionist." In April, Black Spirituals collaborated with Postcommodity, a collective of interdisciplinary indigenous artists, on a workshop and aesthetic investigation at the Guelph Black Heritage Society's Heritage Hall, a church Ontario, Canada that was built by fugitive slaves who'd fled the United States with aid of Native-Americans. Watkins explored the room's acoustics as part of series he calls Tuning Sites of Opposition. He also instructed participants to recite a poem by the great bandleader Sun Ra. The collective recitation was recorded, projected back into the room, recorded again, and repeated, a process indebted to the avant-garde composer Alvin Lucier's influential I am sitting in a room. To Black Spirituals, heritage and musical expression are inextricably bound together. Which is what makes Of Deconstruction's album cover such a potent symbol. It depicts a North Star quilt, embedded with the texture of a ceramic work by Watkins' father. It resembles one on the wall of Guelph's Heritage Hall, itself a monument to collaboration between First Nations and Black individuals, invoked years later by a visit from Black Spirituals and Postcommodity, like a thread drawn through time. The Oakland electronic artist, who performs as Beast Nest, fosters inclusivity in underground circles that too often recreate the values and power dynamics they claim to reject.